Gold prospecting is the recreational act of searching for natural gold deposits in the ground using tools such as gold detectors, gold pans and gold sluices. 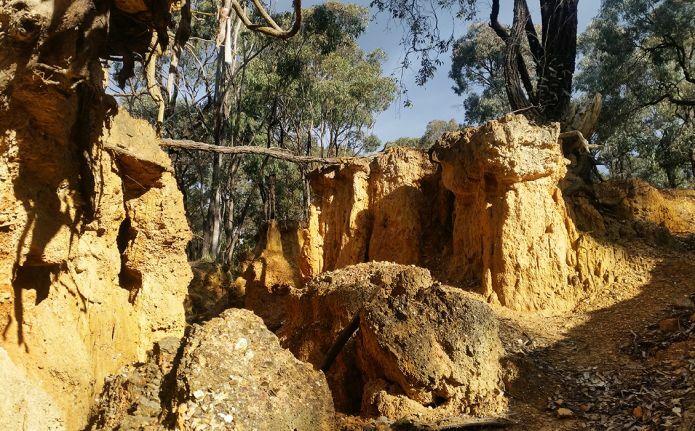 People have been prospecting for gold in the Victorian Goldfields since the 1850's gold rush saw the entire state turned upside down with gold fever! There is still much evidence of the gold rush diggings and the large-scale mining operations which once dominated the region. Abandoned mines, the remains of gold puddlers, and countless ruins/relics are scattered through the region. The Victorian Goldfields are a popular destination for gold prospectors, with many of the world's largest alluvial gold nuggets found in the area (including the famous Welcome Stranger gold nugget discovery in 1869). Modern day prospectors continue to make significant gold discoveries in the region. Take a look at this great list of places to go gold prospecting in the Victorian Goldfields. Please note that this is not a complete list, but shows every place listed on Goldfields Guide where prospecting is allowed. Each location features a map/address, image gallery, and detailed description. This list of gold-bearing creeks and rivers shows some creeks throughout Victoria which are open for prospecting (or have sections open for prospecting). Also check out this list of historical gold maps of the Victorian Goldfields. The list links to historical maps for various towns and regions throughout the Victorian Goldfields. These maps have been selected because they display useful information regarding the location of reefs, leads, diggings, mining operations, and geological features. Do you need a licence to go gold prospecting in Victoria? Yes, you will need a Miner's Right - a permit to prospect within Victoria. A current Miner's Right must be held at all times while gold prospecting. The only time you do not need to hold a Miner's Right to go prospecting is if you are going prospecting as part of an organised group under a valid Tourist Prospecting Authority. Children under 18 years old do not need a Miner's Right while prospecting if they are accompanied by an adult who holds a current Miner's Right. Click here to purchase a Miner's Right from the Earth Resources website. What are the guidelines for gold prospecting in Victoria? Remember that any treasures and valuables discovered while prospecting belong to the Crown and need to be reported to the police. Please ensure that you familiarize yourself with the current legislation regarding gold prospecting. Where are you allowed to go gold prospecting in Victoria? Prospecting is allowed in most State Forests, many Reserves and private property with the land owner's permission. Prospecting is also permitted on Crown Land (except for Prohibited Crown Land), and permitted areas in certain parks under the National Parks Act. A section of an old Maryborough map showing reefs and leads, State Library Victoria. Check out more historical gold maps of the Victorian Goldfields. Where are some good places to go gold prospecting in the Victorian Goldfields? There are lots of great places to go gold prospecting throughout the Victorian Goldfields. 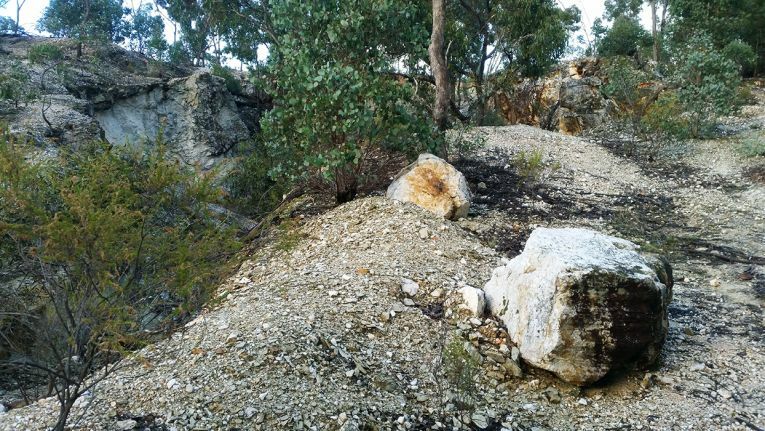 There is plenty of open bushland to wander through with a gold detector, and abundant gullies, creeks and dams to try your luck gold panning or sluicing. Click here to take a look through all the places listed on the Goldfields Guide website where prospecting is permitted. Click here to check out a list of gold-bearing creeks in Victoria where prospecting is permitted. Dead Dog Gully Alluvial Gold Workings, Bendigo. There are many tools that can be used for gold prospecting, including metal detectors, gold pans, gold sluices and gold trommels. Gold prospecting equipment can be purchased from local gold shops throughout the Victorian Goldfields. Metal detector: A handheld electronic device which detects the presence of metal nearby, used by sweeping it over the ground or other objects. Used to discover metal hidden within objects or buried underground. Gold panning: A simple method of separating heavier gold from lighter soil or gravel by washing it in a pan with water. Gold sluice: A channel with riffles along the bottom, designed to trap gold from soil or gravel as it is washed through the channel with water. Gold sluice boxes can be operated using running creek/river water, or can have water supplied with a pump. Gold trommel: A mechanical tool used to separate large rocks from finer gravel or soil. Gold bearing material is added to a hopper. It is washed with water into a rotating drum, where the water and rotation breaks up any lumps. The rotating drum is constructed of a screen material - large rocks are discarded while the finer material is directed into a sluice box. Unexpected open mine shafts are a fairly common sight throughout the bush of the Victorian Goldfields. 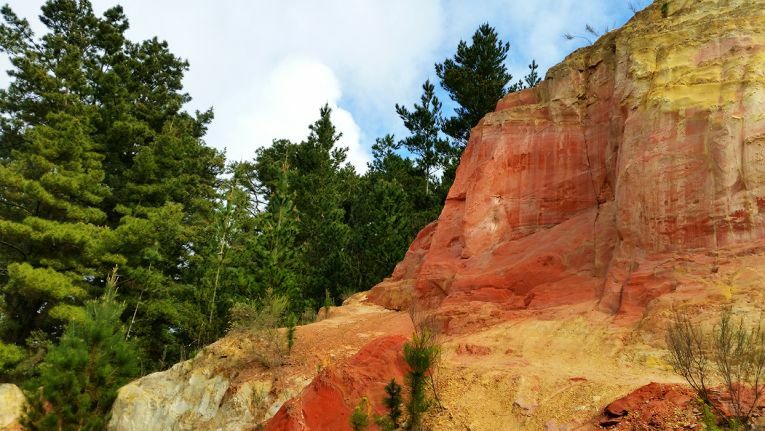 Mine shafts are just one of the many fascinating remnants of our region's rich gold mining history, along with machinery foundations, discarded boilers, the remnants of gold puddling machines, cyanide vats, mullock heaps and more. 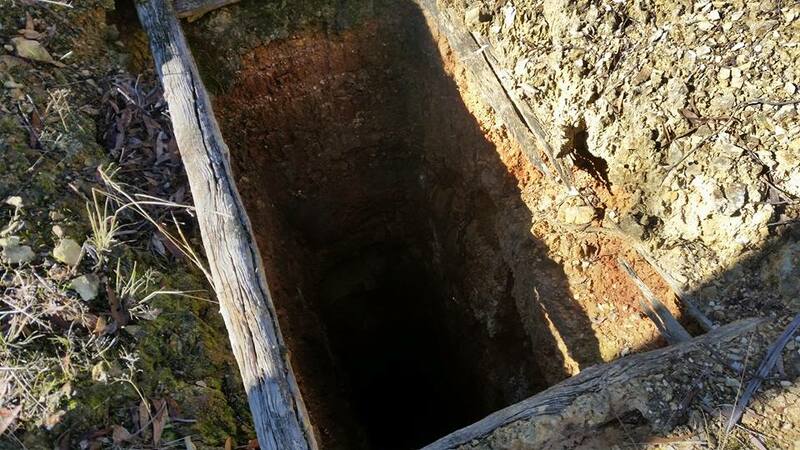 While prospecting off the track in the bush, always be cautious of open mine shafts and keep in mind that even a shallow-seeming dip in the ground could be a deeper mine shaft with a false bottom. Learn more about the dangers of open mine shafts. Always be aware of the dangers of open mine shafts while out prospecting.